Prepare the nation for the return of the Lord! In 1999, I was married to Sheila when the Lord brought the vision back into my mind. It had been removed from my memory for nearly twenty years, but now I had to consider it again. I proceeded with great reservation as I shared what I saw with Sheila. I was cautious because I also remembered how it totally consumed me in 1980, and I was cautious about not letting that happen again. I shared with Sheila that I saw a huge building — a worship center. I remembered that I had estimated the building to be 26 stories tall and that it had seating the size of a stadium within the core of the building. I envisioned huge fluted pillars rising from four central isles. The walls of the massive building were actually rooms—thousands of them—which surrounded the enormous skylight above the center stage. It was so grand and glorious that I even attempted to constructed a small, 12 inch square model of it. But after it consumed me for many months, I had to die to it! I had to totally remove it from my life in order to regain my balance and be responsible to my family and my work. Two months passed and we gave no more thought to the vision of the building. Then on October 23, 1999, something quite unexpected happened. Sheila was attending a Women’s Bible Conference in Euless, Texas. After the conference, several women who were gifted in the prophetic began to minister among the ladies. One of the ministering women—whom Sheila had never met—embraced Sheila and began to speak a prophetic word over her life. After pausing a moment, still gazing upon Sheila’s face as if watching a movie, she continued: “Are you building buildings? I see big buildings, a huge building! There are huge, fluted pillars, marble floors and walls. There will be many, many people on your staff who will be carefully selected. The building is 26 stories tall—it is huge! When Sheila returned from the retreat with her report of the word and the confirmation, I was totally stunned and cautiously optimistic. God confirmed the exact number of stories — twenty six (26) — I believed the building to be, but I still wasn’t moved by the Spirit to proceed. Three weeks later, the Lord woke Sheila in the middle of the night and instructed her to write the vision down and said we both needed to sign it. The next morning she did just that and we both signed it. Shortly thereafter, the Lord started giving me “rhema” words during my morning time in the Word. He told me three different times to “begin now to build!” But I still had to take one more step before I could release my energies into such an enormous effort. I made a random selection in the yellow pages and called a building illustrator and asked if he could recommend an architect—as God would have it, both would be Christian believers. After a brief introduction to the architect, I asked if he would visit with me and tell me if what I was envisioning was architecturally feasible. He spent two hours listening to my enthusiastic ideas and concluded that it was indeed possible to build. And so began the Mt. Zion project. Though the horror of how it consumed me in the past still lingered, I was pregnant again! — and I had to give birth to it. I had no other options. The model of the building begins. This undertaking was a huge step of faith for me – I was not an architect and I had no prior building experience! I had no idea of what it should look like nor exactly how large it was to be. I only knew that it was immense! With this as my starting point, I began to draw on my years as a graphic designer and sculptor. Armed with these two disciplines, I stepped out and began to satisfy the overwhelming unction to manifest the vision which was now exploding within me… a vision that would become Mt. Zion. In the first few days of model construction, the Lord revealed to me that the building was to be called “Mt. Zion.” This is the first time I knew the name of the building. I had no idea of the confirming Scriptures which would be discovered during construction and after completion of the model. The model you are viewing became a burning fire within me! It took almost a year — all day and many days into the night — before the first phase of the model was completed in 2001. I saw the Tabernacle of David! I started to build this massive model in October 2000. In the process, God allowed me to “see my way” into the building. As I figured out how to build each area, God would show me what the next portion of the building should look like. Eventually, I “saw” the entire building! I saw the “Tabernacle of David” recreated in actual size just behind and above the center platform; Prayer and Praise Chambers for intercessors and worshipers; prayer and worship occurring 24 hours a day. I saw the 70,000 seat auditorium and all the gardens under a dome ceiling surrounded by 7,000 attendee living quarters. Mt. 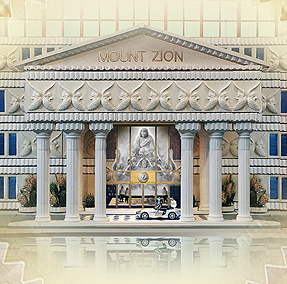 Zion will be a place where the bride will be prepared under the divine hand of the Father. The Holy Spirit is moving with signs and wonders in the church and many are being prepared. Mt. 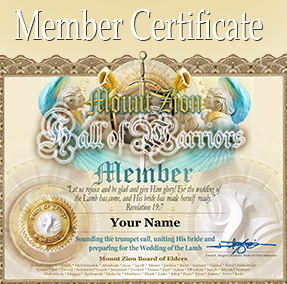 Zion has been designed to glorify the God of Creation and bring global unity and divine revelation for the global body of Christ.